Bob, riding on my left, asks about the route. Does it just go straight along this road into Davis? I say "yup" without even thinking. Signed up for this event a few days ago. Skipped the part about looking at the route sheet. Technically I don't know, but this is the usual way. From 2004 on, the start point has been in East Davis at the Park 'n Ride, using Mace Boulevard to exit town quickly and avoid such encounters. This route is simpler, too. The original was shorter and thus involved riding about a mile and a half past Pope Valley to an orange cone by the side of the road, which served as the turnaround point. You had to be careful to keep your head up for that part; the cone was easy to miss. Every year someone did. The road is Putah Creek Road, the classic route west into the hills from the Great Valley. 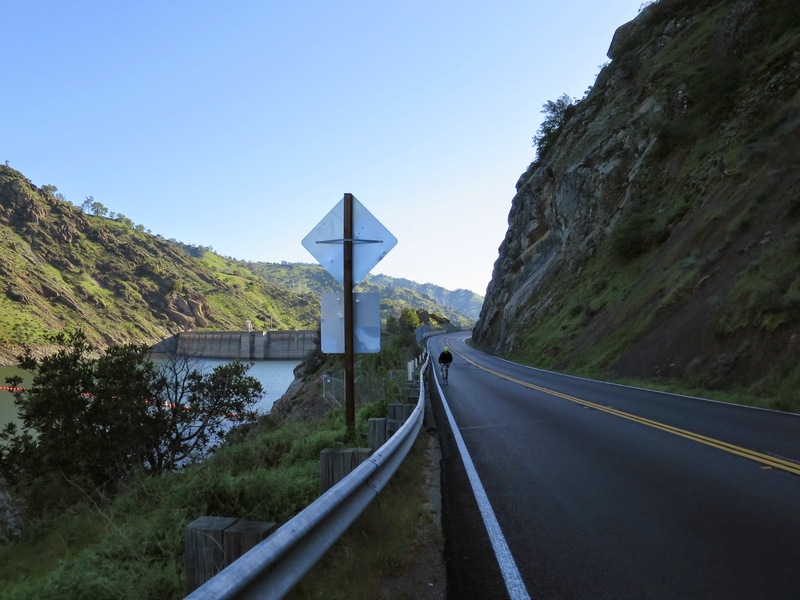 It meets State Route 128 near Lake Berryessa, near Monticello Dam. If you ride a bike in Davis, you know this road well. This morning on the way out, Eric Norris said it feels like he's worn a groove in the pavement. So it's a good bet. It's ~2:30 on a hot afternoon that feels more like early May than early March. It's even caught the boaters by surprise, the weather; they're not out yet with their trucks and boat trailers and jet skis. It's almost relaxing! We're spinning through an agricultural plain that looks spare and flat. It has some interesting stories to tell, both natural and human. Good farming country. All it takes is a nice strong headwind to see it differently, though. Today it's a real struggle. A fight. This rational thought does not stay long. Over a few short minutes, Bob is sucked ahead into the distance, my brain waves go flat and with each passing moment my legs are feeling heavier, more reluctant. As if they're barely capable of walking, much less riding back to Davis. The next thing is a dizzy spell that's so intense it seems like I might pass out. Or perhaps throw up. My stomach doesn't like heat. It never has, and yet after brain injury and its stomach havoc and the sneaky way it has of sending the balancing systems of the body (electrolytes for one) haywire, the new pattern is for these moments to arrive without warning. Of course, I haven't been eating enough - tough to do in the land of little stores selling Hostess Donettes. Especially tough when you're feeling sick from the heat. Good reasons, and yet... when you get out here on a brevet, on some level you pledge to deal with all the messy, unwelcome complications that visit you on the road. Figure out how to ride on in. Headwind or no. Cooperation from the body, or rebellion on multiple fronts. During the Randonneur Social Hour in the morning and the solo despair that visits you in the glaring afternoon. Somehow I get my right hand back and down into the jersey pocket. Pull out a bar, tear it open, and eat half. To my surprise it goes down. Better. Enabling me to reach for a gel flask and take a pull from it without gagging. Yuck. Again, a little bit better. Then Paul, whom I passed about thirty minutes ago, passes me with Sandra in tow. going impossibly fast. I latch on for dear life. Stop paying attention to what it feels like to keep riding, and focus on staying with them. Almost out of water. The mini-mart at the corner of Sievers Road and 505. Paul and Sandra aren't stopping. There's water in Davis, too. It's not going to kill me, nine dehydrating miles. But it's a hell of a way to end a ride. A month ago Friday there was an incident on Old River Road near Ukiah. It can't realistically be called an accident. Several people have asked if I'm related to these people. Well, yes. And no. I know and have ridden with all 5 cyclists who were hit. Two of them are Danny's brothers. He almost lost them both; it was a close call. But as far as being related to me, that is not at all clear. When the phone call came, about 5 hours after the collision, Danny's face went still and then it went grey. He listened, asking a few key questions. No one had life-threatening injuries? OK. I waited for him to hang up, then got the story. The brother who called was less seriously injured and already out of the hospital. No doubt in shock, and a ton of pain. The older brother, the more seriously injured of the two, never did call. There was no request to assist with the shuttling of cars and the crazy logistics that are required when something serious and unexpected happens. Danny's offers of help were refused. We did not go to anyone's house to visit or help out. We did not deliver food. There were no updates, except when Danny reached out. The accident in Elaine's TBI Story (in 2008), created a rift in Danny's family. Many families go through something similar, but this rift is irregular and unique. For one thing, it is based on avoidance or denial of facts. The person with the most severe injury in the accident becomes the target of anger. The family member who ultimately suffers the most and is hit the hardest, was not in the car at all. The two brothers and their wives were at the center of the family cluster here in the Bay Area. It seemed like a happy, close-knit bunch, often getting together and doing fun outdoor stuff like hikes and bike rides. Noisy, joking, plenty of food. Gatherings always happened at one of their houses; ours is really too small. Over the course of a decade, the older brother and his wife and I often went on bike rides and trips. In fact, we were on our way to a bike trip in San Diego when our car smashed into the stopped cars on I-5. The sister-in-law was at the wheel. Danny's brother was in the front passenger seat, which my head was thrown into. Then things got weird. There were no visits and the few phone calls that came, more or less had the same theme: what was going on with me? Not exactly how was I doing? but more what was going on? It was hard to tell. After the accident, it took a while to understand I was hurt. Then it took a long time to get help figuring out what exactly was wrong. That is normal when you have the kind of injury that's tough to diagnose. The insurance company was difficult. They say it's to protect against fraud but I think they behave badly because they can. They're in the middle so they play the parties off each other. After much wrangling, they offered $5000. Almost nothing. More had already been spent on medical help, and there was no light at the end of the tunnel. Neither I nor anyone else could define what was happening to me and my daily life was spinning out of control. My performance at work was suffering. Two years in, as the legal deadline approached, I filed suit. In California, there's no way to sue an insurance company. You have to sue the policyholder. Which in this case was the owner of the car, Danny's brother and his wife, the driver at fault. They were never in financial danger but the insurance company no doubt spun them a different story. One that they chose to believe. Fast forward 4 years. But life does not stop, it goes on. A phone call with serious news. My heart goes to Danny, and my thoughts to the cyclists who were hit. Instinctively, in our own minds, we are part of the family. After realizing they are more or less OK, the thought comes: I wonder if they will understand? The broken bones were visible on X-rays. Severe abrasions. A horrible outcome on a beautiful day, a nightmare. But (probably) no brain injuries, nothing truly complicated, nothing you need a neurologist for. I happened to be at Robert's Market, in Portola Valley, ~ mile 10. It was lunchtime; I snacked before leaving the house but you know, there is snack-riding and then there is meal-riding. Heading to the coast you need real fuel. A free table - completely free! - in the blazing February sun. Set down the provisions: one of those new Chobani yogurts with the walnuts and chia seeds, potato chips, and a Pellegrino soda. It's easier buying simple GF things than examining ingredient lists or asking for GF bread in the deli (No). And the sugar will help with Old La Honda. Among endurance cyclists there is a saying: calories is calories. All around are cyclists. Alpine Road and the market and the outside tables are swarming with them. Of course the empty-except-for-me situation does not last. A 60-ish man approaches, wearing an AIDS Ride Leader jersey. There are so many cyclists on their training ride, he's lost track; am I one of them? I am not. Yes, he can sit. One by one, the benches fill up until we are 5 at the table. We introduce ourselves. I learn that this is Ride Leader's fourth AIDS ride. That he also likes ballroom dancing with his wife, and finds it to be quite the workout. They go to Cheryl Burke's studio in Sunnyvale. The woman on my right, well, this is the moment I confess that seeing her entering the store sort of set off my annoyance alarm. It had nothing to do with her, except she was wearing that AIDS Lifecycle jersey. And sometimes the benefit riders can be self-righteous. You never really know what you're getting. And I'm weary of navigating systems and groups with lots of overhead for me and no payoff. It's unwieldy, dealing with the masses. It's not just the long queue at the register. Their idea of what riding is not the same. It does not involve hardship, typically. Or darkness. Or hunger. Or days on the bike, days on end, solo. There are different cultures in cycling, and the cultures can clash. They learn I'm a randonneur (it's on the front of my jersey). Very long stuff, I explain. The woman is lovely; on her smartphone (perfect long red nails) she digs up a photo of her friend from near Sacramento who started riding brevets, you know, to do that Paris thing. PBP, or whatever. The photo is very sincere. I feel so bad for being annoyed before. Directing my resentment toward this woman who doesn't deserve it. She did the AIDS ride twice but couldn't do it last year because she hurt her back. So she drove SAG. And worked remotely from Starbucks along the route. One of the other guys tells how she ferried him, after he dropped his smartphone, back along the route in the Salinas Valley until they found it by the side of the road. "Yeah, find my iPhone", he said. "We used that feature." Everyone laughs, including me. Suddenly it feels so good to sit in a small, open group like that and laugh. Can't remember the last time that happened. But it's definitely something I need more of. And here it is, just happening around me. If I had been with a group, there would have been no empty spots at the table. It's time for all of us to move on. They're looking forward to the end of their ride (50 miles), and all the climbing's done. I have miles to go, hills to climb, and the shadows are getting longer. Friday late afternoon, almost dark, almost the solstice. In an office park, bus after bus pulls up to the curb in the rain, collecting tech workers to ferry home. They are silent and mostly preoccupied, weary, not noticing much. Not the imposter in their midst despite a bright red wool cap, red jacket, heavy black wool leggings. Less visible are the butterflies in my stomach. Unsure of the right bus. Excited and scared to try a new version of this route. Looking forward to the beauty of North Coast, much needed relaxation, and especially, a visit with my dad. Cycling clothes are not unusual these days, especially among my younger coworkers. Mostly casual, understated pieces (with high price tags) that do their best to resemble street clothes. An outlier who dares to look up from a smartphone might notice the difference: full-on winter cycling gear, right down to toe covers on Sidi shoes. Over the next 4+ days I will need every bit of warmth and function this outfit can provide. What is there to lose? The daily mind-numbing office grind. Carpets and computer screens and badges that unlock doors. The way it consumes all life energy by default. A cadre of peers who are talented and entitled and naive, all at the same time. Know-it-alls who survive on free food, judge themselves a little too favorably. My affluent, backward suburban neighbors, policing each other, wanting nothing but the status quo. You can have so much and still be poor.